Pinot Noir is a delicate wine, characterised by its red fruit flavours which include hints of cherry, currant and raspberry. The flavours and aromas of a Pinot Noir develop with age and become more complex; wonderful earthy notes of mushroom and decaying leaves can become evident. 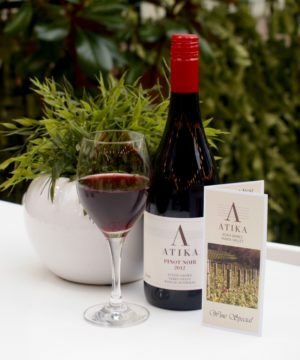 The Atika Pinot Noir displays a vibrant colour and lifted nose of red fruits. A hint of toast from the oak is also evident. The palate is well structured with good acid and it has a fresh finish that brings back the red berry ripeness.